Tim has spent countless hours making other employees’ jobs easier and ensuring that all areas of the Agency are taken care of. He consistently goes above and beyond. Communications supervisor may not be a very visible, upfront job, but it truly is the backbone of our operation. Tim works hard in the background to make sure all aspects of Communications are functioning at full capacity. Tim maintains multiple systems to include CAD and CAD to SIREN, and helps develop ways to make documentation and data collection easier. Tim has just completed his year as RCC (Radio Communications Council) chairperson for the local Charlotte P25 Radio System while also attending CAD Administrator training. 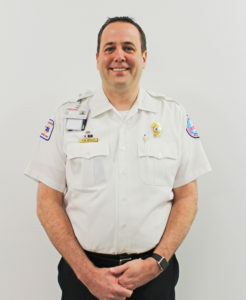 He has been a liaison to our County Fire departments and County First Responder agencies, and he’s active in the County Fire Association meetings as well as with providing radio and pager assistance to the departments. Tim often assists at the MOC (Mobile Operations Center) during special events such as Panther’s Games, Speed Street, or New Year’s Eve, using his COM-L (COM Lead) or COM-T (COM-Tech) as support roles for Communications/ICS functions. He also leads the distribution of Medic’s new portable radios and additional mobile radios. Tim is a stellar MEDIC employee—consistently kind, compassionate, and eager to help wherever he’s needed. During many night shifts, crews have reported issues, knowing that whatever the hour, Tim would provide assistance. Tim will go the extra mile to help everyone he meets and is genuine in all that he does. You can see his dedication to his family, friends, and this Agency in his every action.